How Digital marketing helps in increasing business revenue? A successful business is the aim of all marketers in the industry; to improve the business standards and drive customers to your website – you need a successful digital marketing strategy built by SEO experts. There are millions of websites on the Internet, but not all websites are ranked on the search engine results page; Google or other major search engines give importance to a highly optimized website with relevant and updated content. In the Internet era, Search engine visibility is more important to gain customer attention. The change in customer expectations and the growth of new businesses will force the marketers to stay competitive in the global market, but one cannot gain customers only with their business – an SEO optimized website also play an prominent role in taking your products or services to people. How successful SEO strategy is created? Digital marketing is comprised of SEO, social media marketing, PPC, content marketing, email marketing and online reputation management. SEO is a prominent factor of digital marketing techniques – it draws free or non-paid organic traffic to your website by the means of promoting your product or services in the search engines, social media using the unique content. Keywords: Keywords help to understand what people are searching on the Internet – it assists to identify the industry-relevant search terms commonly used by customers to discover the business. The keyword analyzing software such as Google keyword planner or other third party tools will help in finding new keywords that can be used in your website content, meta description, title, image tags, H1 tags, and others. Content: The keywords are ranked based on the content present in your website; creating unique and quality content at your niche is very important in gaining search engine rankings and building positive user experience. Backlinks: Quality backlinks that link back to your website will improve the website reputation. Build industry relevant blog posts, press releases, infographics that can influence the customers or bloggers to use the link in their content. Social media: The social media has changed the way the website is ranked on the search engines– the presence of social media accounts with consistent interactivity and update will signal the search engines to rank higher. E-commerce business with strong social media presence can gain new customers and increase their business conversions. It also helps people to find you on the social networking websites like Twitter, Facebook, Pinterest, Instagram, among others. Multimedia content: Multimedia content like images, GIF files, and videos are also given prominence in website ranking – the people search for the product or services will not only pay attention to web page results but also the image results. Ensure you use quality multimedia content with keyword based names to enable them to get ranked on the search engines. Mobile responsive: Today 60% of the users are searching the products or services on their mobile phones; to gain local search engine rankings and to expand the customer reach – one needs a responsive website design that adapts with all display screens. Mobile responsive websites can improve website speed, minimize website errors and helps in enhancing the website performance. How digital marketing benefit businesses? 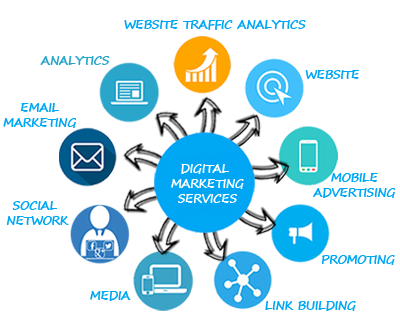 The Digital marketing services when performed effectively will improve the overall business growth. To obtain the maximum benefits from digital marketing, hire a professional SEO expert to help you in reaching new heights.